We’re pretty lucky at fabulous, we get to work with jewellery every day so as you can imagine we tend to have pretty big jewellery collections. This week at fabulous we’re embracing Spring by indulging in some serious sorting and cleaning. 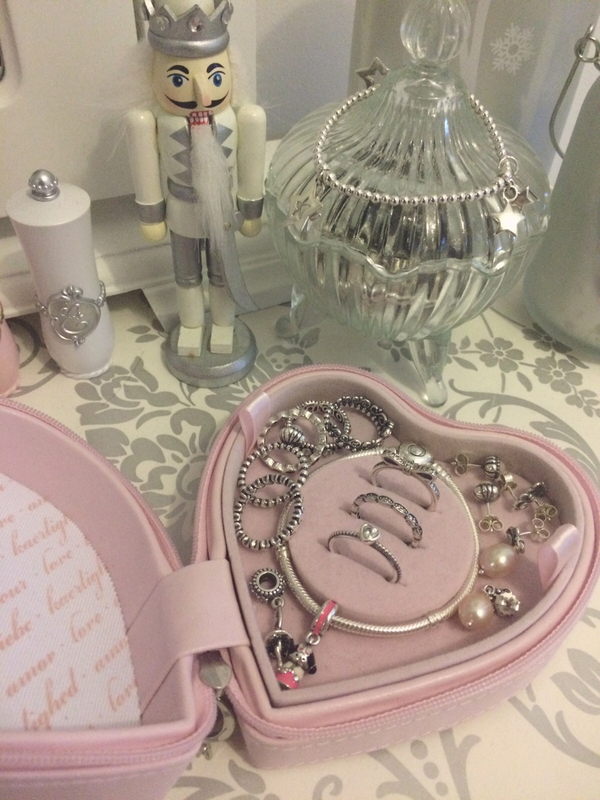 Katie from our Solihull store sent us these photos of her jewellery box before and after a little Spring clean and it’s inspired us to head home and do the same! We love her vintage decanter, the perfect place to store some ChloBo! How do you store yours? 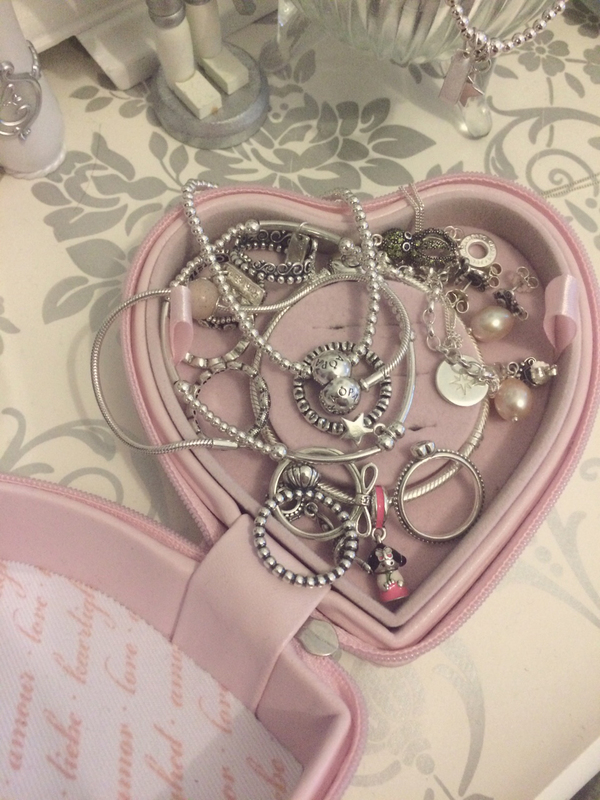 We’d love to see your jewellery Spring clean photos! Mother’s day falls on Sunday 15th March and to celebrate the special occasion Pandora have a fabulous new collection to celebrate the inspirational women in our lives. The limited addition engraved ‘always in my heart’ bangle (590722cz) costs £75; made from Sterling Silver with a glistening Cubic Zirconia clasp. There is also an exquisite limited addition ‘always in my heart’ charm (791523cz) with 14ct and clear Cubic Zirconia detailing, with the message ‘always in my heart’ delicately engraved at the cost of £65. The classic sparkling heart gift set (B800056) is also limited edition, comprising of stunning clear Cubic Zirconia heart earrings and necklace. The set includes a small Pandora jewellery box and costs £99; this flawless set is the perfect gift to make your Mum feel truly special. The clear Cubic Zirconia heart ring is the icing on the cake to this elegant set, at the cost of £55. 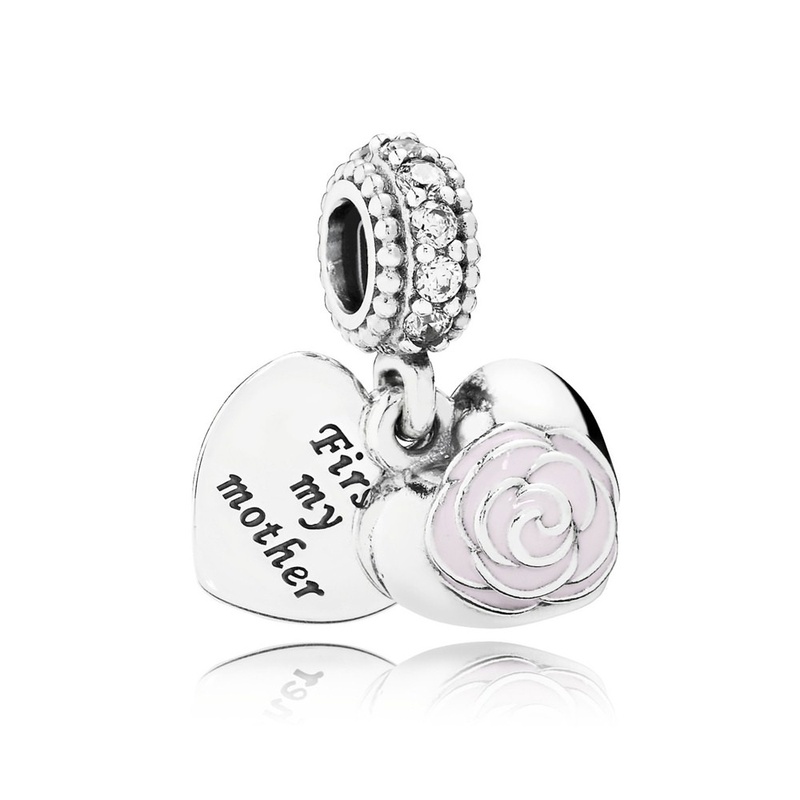 A new addition to the Rose collection, the lovely message ‘First my mother, forever my friend’ (791528en40) has an embellished rose on either side of the charm, symbolising love and beauty and costs £55. 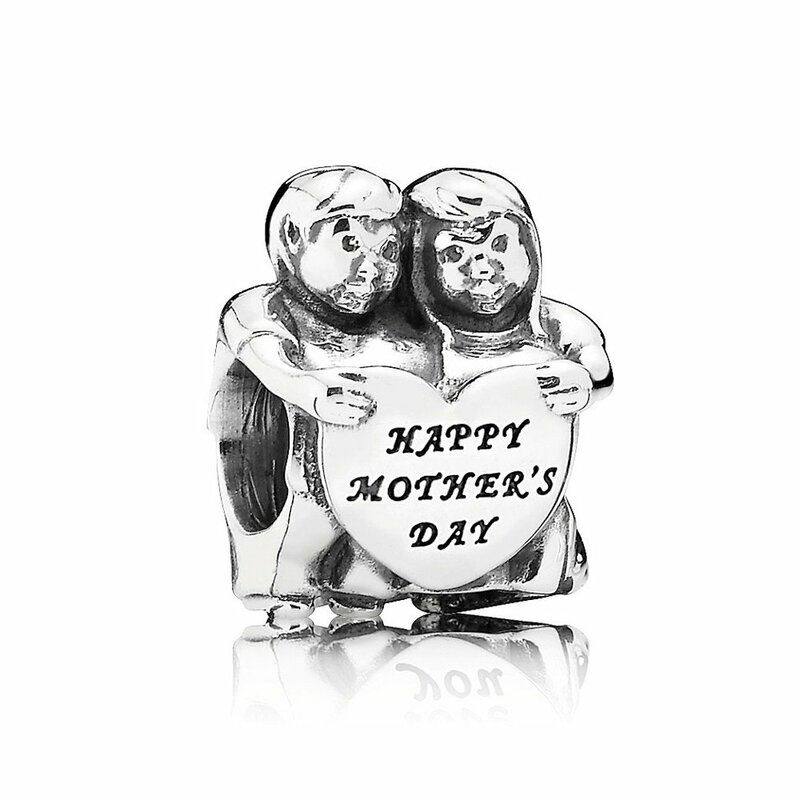 In addition to our new Mother’s Day collection, we have some lovely personal charms for a shared gift, the ‘from us’ Sterling Silver charm is only £35 (791517) and has a boy and girl arm in arm, with the message of ‘happy mother’s day’, perfect for your mother to remember the occasion of the charm! 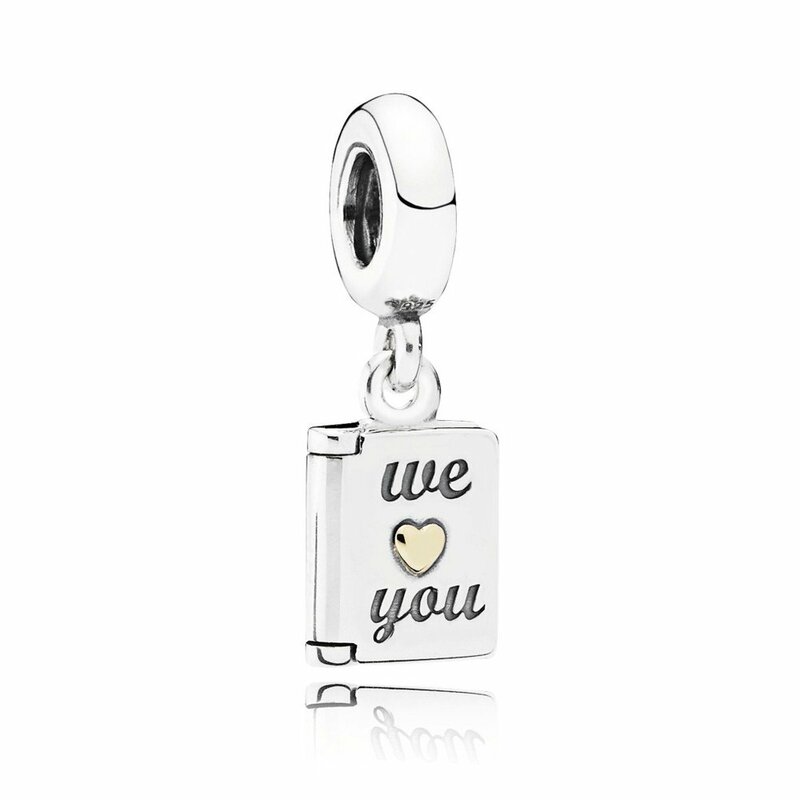 The ‘we love you’ charm costs £60 (791532) with a desirable 14ct Gold heart in the middle of the message, surrounded by Sterling Silver in the shape of a book. The ‘motherly love openwork’ charm (791519) is made from Sterling Silver and would look perfect with the limited edition bangle. 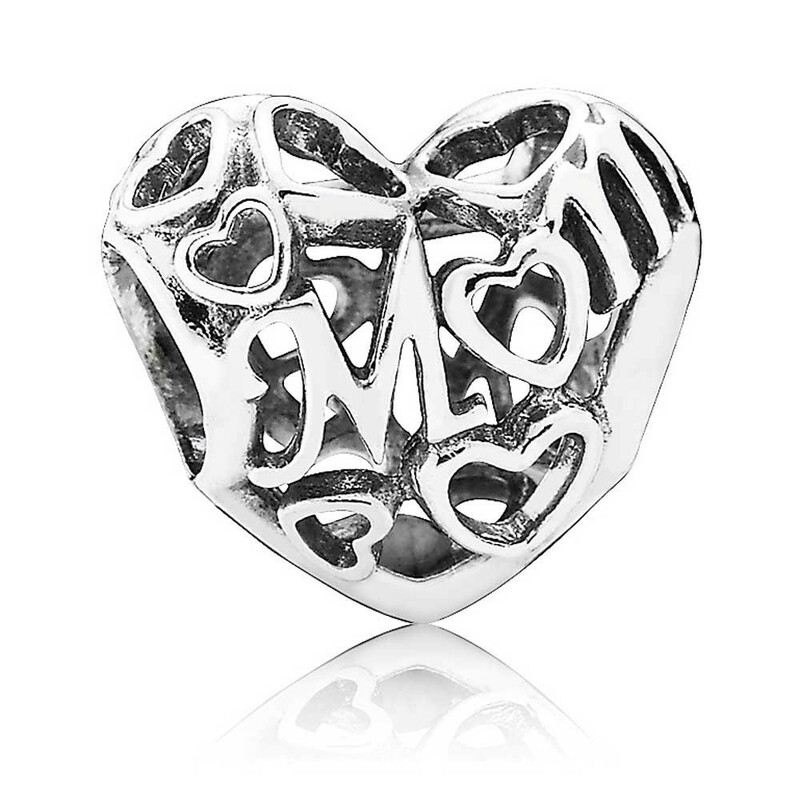 The new charm has striking openwork with hearts and also spells Mum in the middle costing only £30. The ‘Mother’s pride’ (791520cz) spacer is also from the new collection, consisting of clear Cubic Zirconia and Sterling Silver, for only £25. The ‘sweet mother’ dangle charm (791285CZ) is from the previous collection and contains Cubic Zirconia and pink Enamel on the inside of the charm. On the outside it contains flourishing flowers, embedded on the charm and costs £55. It makes a beautiful Mother’s Day gift and would also look wonderful on a necklace. NEW: Which Pandora Pre-Autumn Collection will you be wearing? If you loved the Summer symbols collection then you’ll be excited to hear that they’ve added more to the collection. Aspiration, Freedom, Guidance, Infinity and Trust are a few of the fabulous symbols which you can add to your bracelet or wear as a pendant this Summer. Which would you pick? This collection of delicate bracelets to wear with your Pandora collection carry symbols on chains including the Hamsa or Horsehose representing protection and luck. New this year is the selection of Rose Gold symbols, the beautiful rosy tone will bring some texture to your bracelet or necklace and will make a fashionable addition to your collection. Adding Rose Gold to your necklace or bracelet is a fabulous way to bring your jewellery look up to date, symbols include Faith, Love, Luck and Trust and are embellished with sparkling CZ. NEW PANDORA: Add some colour to your Summer! So it felt like Summer for a couple of days but with the rain coming down we’re in need of some serious colour – enter Pandora! We’re very excited about the new Summer collection which has just arrived, summery shades of vibrant coral and turquoise, mixed with Miami-style kitsch flamingos are the perfect accessories to brighten our mood! 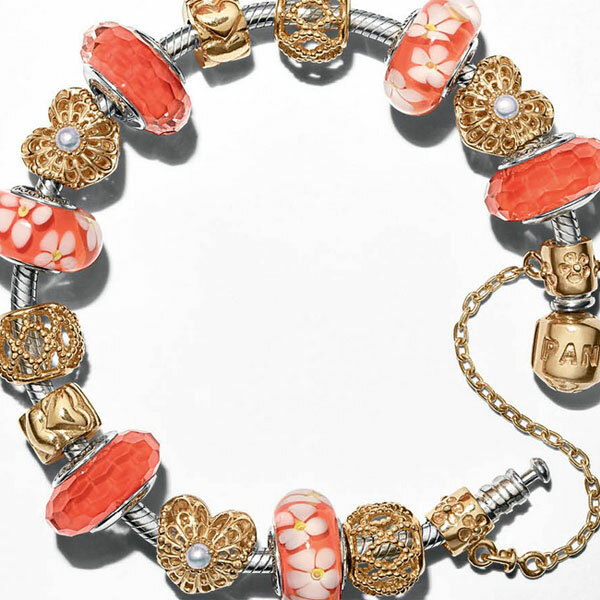 Floral Orange Murano Charm, £30. Teal Murano Charm, £30. Orange Faceted Glass Charm, £35. Sparkling Teal Pave, £55. Seahorse, £35. Flamingo, £40. Orange Floral Murano, £30. Orange Faceted Glass, £35. Gold Charms from £185 each. We know how much our Pandora customers love the limited edition charms, so we are thrilled to introduce the new Pandora limited edition bangle! 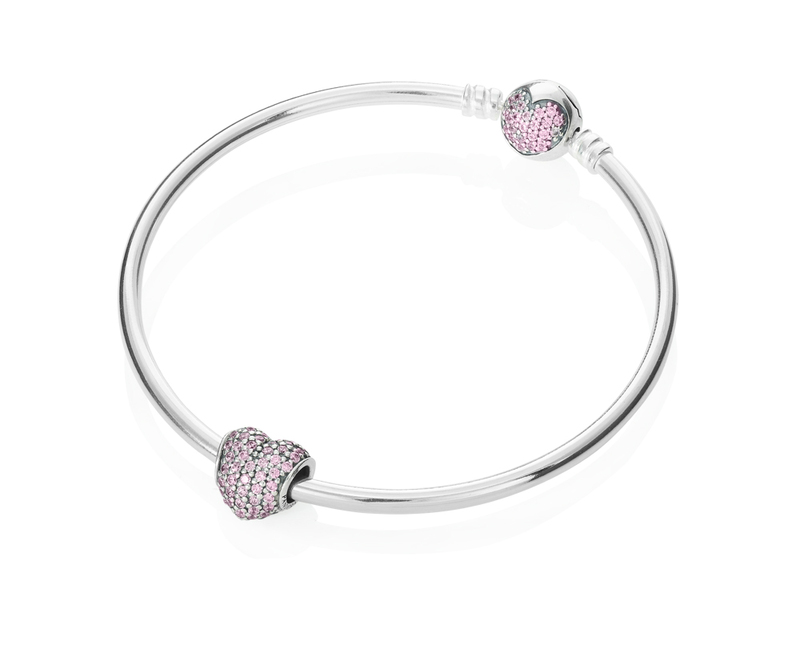 The Sparkling Heart Bangle (£99) is a delicate piece featuring an exclusive pavé heart shaped clasp matched with a pavé heart charm, both in a lovely pastel pink. This bangle is available in three different sizes so join us in-store and find the best fit for you. Or call our hotline and we will post it out to you with free UK delivery! I love Mother’s Day, it’s a great opportunity to celebrate the love and support from my Mum, and while I appreciate her every day, it’s a great day to focus on my Mum and spoil her like she deserves. This year especially I have a lot to thank my Mum for. She has been my rock, has given me endless love and support in helping me through a very difficult time which I will forever be grateful for. For this reason I will be truly spoiling her this Mothers day! My mum loves flowers! (What Mum doesn’t?) But this year I wanted something a bit different. Flowers are lovely and look great for a week but I want to get mum something she can keep. I think a necklace from ‘Flower jewellery’ will be perfect, flowers that she can keep for a life-time and wear them with her wherever she goes. I am still deciding between the Forget Me Not round necklace (£30) or the Rose Bud Baton necklace (£20). Mother’s day is about celebrating the relationship between you and your Mum and what makes it special. Although myself, my sister and brother have all flown the nest we all know that Mums door is always open for a cup of coffee and chat! 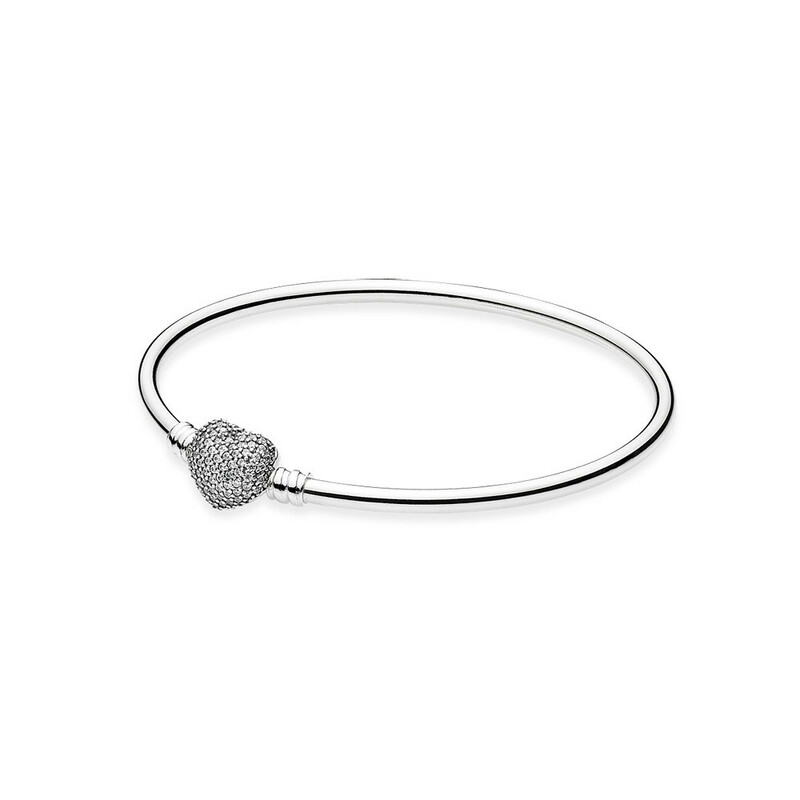 For that reason I am buying her the Pandora teacup charm (£25) for her bracelet. This will symbolize the endless catch ups we all have, after all, what can’t be solved with a nice cuppa! A cuppa with Mum solves everything! 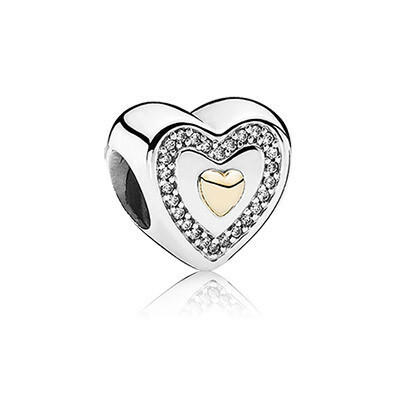 I will also be buying her the new ‘lots of love’ Pandora charm (£55) I chose this charm as it features one little 14ct gold heart amongst lots of pink enamel hearts, to show Mum she really is one in a million. If you’d like some help choosing the perfect present for your Mum, come down and see us in-store or call 0845 450 9334 for some personal shopping advice. It’s a great time to add a sentimental charm to your Mum’s bracelet. We’ve selected the Silver Mum charm, £30, the Mother and Daughter hanging charm, £65, the Family bead, £35 and the Loving Mother hanging Silver charm, £35. These are our most popular Pandora charms for Mother’s Day and all make fabulous gifts. If you’re looking for something more subtle, we have a beautiful limited edition Openwork Vintage Heart, £65, it’s made from Sterling Silver with the addition of a 14ct Gold solid heart. This charm would make a great addition to any bracelet and is a classic piece that anyone would love to receive! Our next addition to the Mothers Day Collection is the Lots of Love pink enamel charm. This charm has beautiful pink enamel hearts all the way around with a lovely 14ct gold heart. This charm is £55 and is great for anyone looking to add some pastel shades to their bracelet. Our final addition to the Mothers Day Collection is the NEW pink Enamel Rose Collection. This is a lovely range which has a wonderful feeling of Spring! It fits in beautifully with our Mothers Day Collection and includes the Pink Rose Enamel Clip for £45, a Pink Rose Enamel charm for £35 as well as matching Earrings for £40 and a beautiful ring for£40. All are made of Sterling silver and Pink enamel. All of these charms would be a great addition to your mothers bracelet and will defiantly make her feel special on Mothers day – Sunday 30th March! Call our Pandora hotline on 0845 450 9334 for more information or to order, we offer free UK delivery and free gift wrapping service!